1. 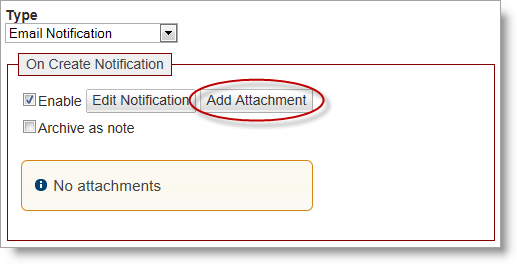 From Admin>Auto Tasks, open the desired Email Notification task. 2. Click the Add Attachment button shown below. The screen below will appear. Note: be sure to open the task first by clicking the + next to the task name, just as you did when you created the email notification. 4. Locate the file you wish to add and double-click it. The file name will appear in the Add Attachment box. If you wish to select multiple files, you may click Browse and repeat the process above, OR from your document list, you may click on the first file, Ctrl+click on any other files, then click the Open button at the bottom right to add them all at once. If you have selected a file in error, click the red X next to the file name in the Add Attachment box. If you wish to remove all files you have selected from the Add Attachment box, click the Clear List button at the top right of the screen. 5. When you are finished selecting your files, click the green Add button. 6. Scroll down to the bottom of the Auto Task screen and click the green Update button. 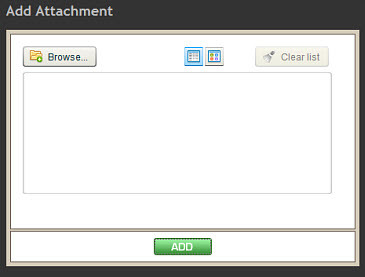 If you do not click Update after adding your attachment, it will not be saved. Note: To return to the Creating Email Notification instructions, click here. To return to the Adding Images instructions, click here.